Creating social and infrastructure assets to foster economic growth and civic expression for the community. MKSK is assisting with the implementation of a reinvestment strategy and identification of catalytic projects to create an innovation corridor and eastern gateway to the Uptown District in Cincinnati, Ohio. 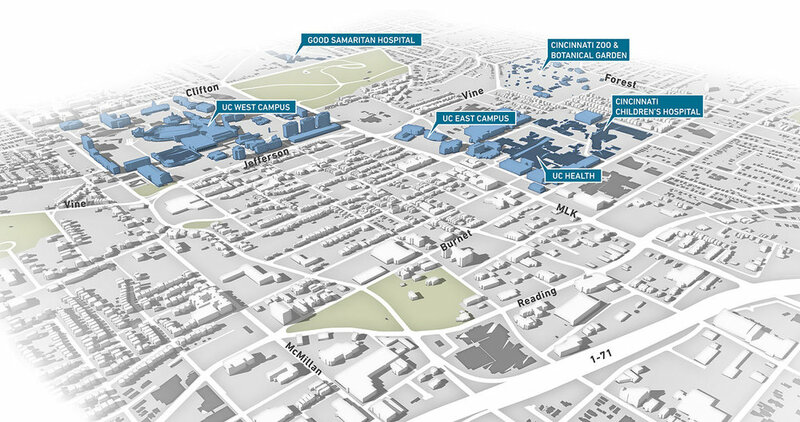 The plan will leverage current annual economic impact of over $3 billion driven by the University of Cincinnati, adjacent hospitals and health science institutions, and the new $80 million dollar interchange off of I-71. MKSK is working with the Uptown Consortium, a non-profit community development corporation founded by the chief executive officers of Uptown Cincinnati's largest employers: Cincinnati Children's Hospital, UC Health, TriHealth, University of Cincinnati, and the Cincinnati Zoo. The strategy identifies redevelopment scenarios in priority investment areas that align the Uptown Vision with institutional planning, market feasibility, and community context. The redevelopment scenarios demonstrate site capacity, development feasibility, and economic impact to the district by providing detailed site plans and development data. The goal is to attract private development investment along multiple land holding that will create a new dynamic mixed use center. Preliminary massing and modeling in 3D illustrates site potential. Strategic investment scenarios build on the momentum of the planned (now open) interchange along with a previous vision study for the Martin Luther King Drive (MLK)/Reading Road Corridor. The plan involved the institutional partners along with community participation through a public engagement process.